An EMF Filter is a well-tried and tested electrical engineering solution to problems of electromagnetic (EM) pollution. Each home, clinic or office takes between 3 and 15 filters to reduce the GS units of dirty electricity, ideally down to 30 for people who are electromagnetically sensitive (ES), or down to 50 for others. 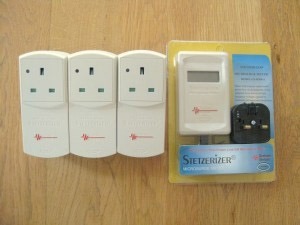 To ensure that you get the best results with your filters, we recommend that you either buy a Stetzer Microsurge meter (or get a reduced-price one, with one of the filter packs shown below) or arrange for an EMF survey for installation of the filters. Measuring with a meter determines the optimum positions and quantity of filters to minimize the GS units of dirty electricity. We recommend 3 filters and a meter at first, since using the meter you can find the best location for your filters in your home. Three filters are the minimum number that brings the GS units of dirty electricity down in most situations.